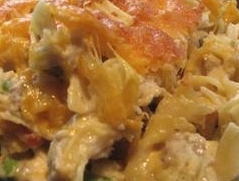 This homemade tuna noodle casserole is creamy and delicious. This is comfort food at it's best. Add chicken and you'll have a hearty chicken noodle casserole that's creamy and delicious. This casserole is creamy and seasoned perfectly. This is comfort food at it's best. This recipe is requested often. For a change, you can use chicken instead of tuna; you'll have a hearty creamy chicken noodle casserole. PREHEAT oven to 425 degrees and spray a casserole dish with vegetable oil. In a skillet, add the onion, celery, mushrooms and peas. Season with the garlic and onion powder, and sauté until tender. In a large bowl, whisk the sour cream and milk together with the three cans of soup. Add the cheddar cheese, sauteed vegetables, cooked pasta and drained tuna; mixing well. Mix the cracker crumbs with the melted butter and sprinkle over the top of the casserole. Bake for 15 to 20 minutes or until heated through. You may top the casserole with more cheddar cheese and then sprinkle the crumb mixture over all.